UPDATE: Animal and Bylaw Services charged both the owner of the BULLY BREED dog as well as the person in care of the pet at the time of the attack with one count of attack causing severe injury and one count of unlicensed dog. Calgary police and Animal & Bylaw Services are investigating a late morning dog bite in the northwest community of Ranchlands that sent a young boy to hospital. EMS spokesperson Stuart Brideaux says a paramedic crew responded to a location in the 6900 block of Ranchero Road Northwest at approximately noon following reports a child had been injured by a dog. A five-year-old boy, suffering from significant, soft tissue injuries to his face, was transported by ambulance to the Alberta Children’s Hospital in serious but stable condition. According to neighbours, a family of five resides inside the home but the victim is believed to have been a visitor. The family's dog is believed to be a ROTTWEILER-CROSS and neighbours consider the dog to be 'nice and gentle'. Animal & Bylaw Services says the number of reported serious dog bites in Calgary continues to rise, a trend suspected to be the result of improved reporting and community awareness and not an increase in actual bites. The City of Calgary Animal & Bylaw Services assesses the severity of dog bites on a scale of one through six. Teeth touch skin but no puncture. May have red mark/minor bruise from dog’s head or snout, may have minor scratches from paws/nails. Minor surface abrasions or lacerations. Two to four holes from a single bite, typically contact/punctures from more than canines, considerable bruising. Black bruising, tears and/or slashing wounds. Dog clamped down and held and /or shook head from side to side. Multiple bites at Level 4 or above. A concerted, repeated attack causing severe injury. In Calgary in 2014, there were 244 dog bites of a Level 3 severity or higher. 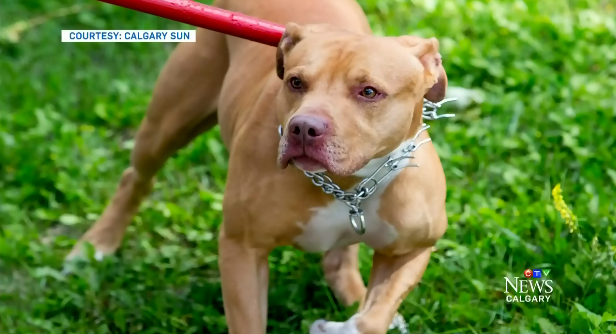 An increase from 2013, when 198 bites were reported at, or exceeding, Level 3.
just another catch-pole pittie . good old calgary with its "enlightened " approach to dog bites .